Posted September 28, 2011 by Film and Religion & filed under Pictures. Lee Gilmore, author of “Theater in a Crowded Fire: Ritual and Spirituality at Burning Man” posted an essay about the spiritual aspects of the Burning Man phenomena. 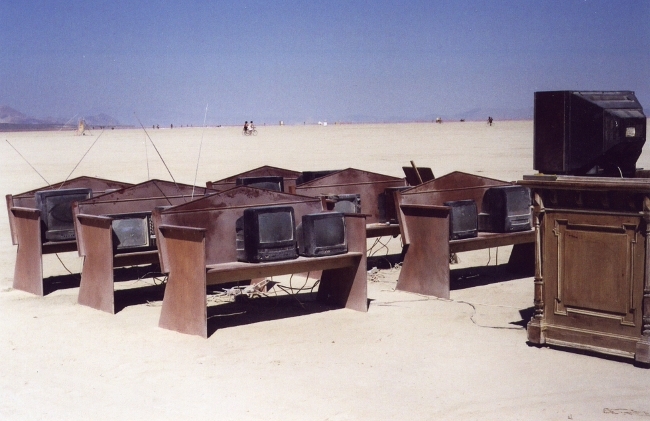 In it she included a though provoking image that needs to be shared here as it fits the theme of this blog: little TV sets watching a big one in a classroom or church like setting.